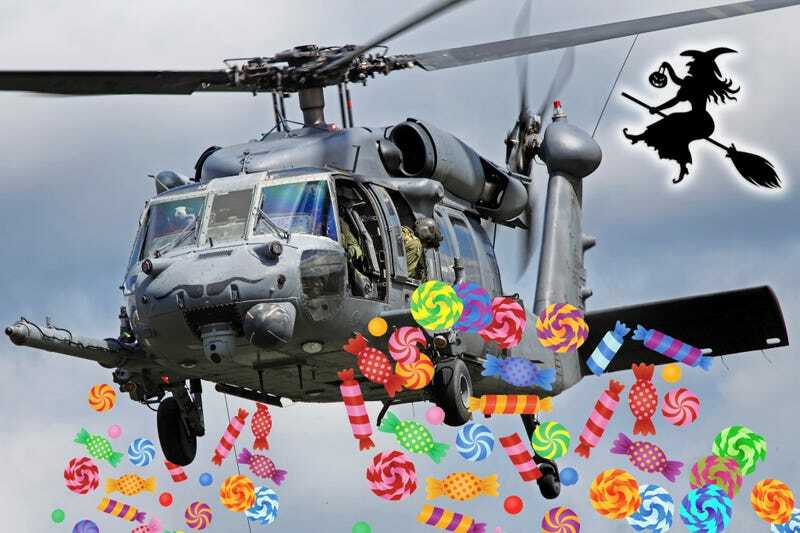 After an evening training run, an Arizona National Guard UH-60 Blackhawk arrived overhead a Halloween party for what has to be the most spectacular trick or treat ever. It came to a quick hover and dropped at least five packages of candy down to the kids below. Neighbors were stunned, and the pilots are now in a cauldron of hot water. "The incident was not sanctioned by the Arizona National Guard and will be investigated further to ensure it does not occur again. The Arizona National Guard does not authorize nor condone the use of military aircraft or equipment for personal use." In a world of smart phone cameras you really can't get away with anything anymore, not even delivering some snickers bars to your friends via a $10M government issue chopper.